Ruby L. Turner is a native of Chesterfield County in the Richmond, Virginia suburbs, is a retired employee of the Chesterfield County School System with 32 years of service. She is now a part-time employee in the President's Office of Virginia State University. Ruby is a widow and the mother of George M, who is affectionately proud of his mother's accomplishments through the years and is thrilled that she won the MS. Virginia Senior America Pageant in Fairfax, Virginia. A long-standing member of the First Baptist Church, Centralia, Ruby served as Church Secretary for more than 12 years; sang in the Adult Choir, served as sponsor of the Children's Chair; served as secretary to the Church Scholarship Committee; member of the Ladies Auxiliary Usher Board; member of the Senior Missionary Society; member of the Affiliated Senior Citizens of Metropolitan Richmond; and has served as president of the Golden Fleet Senior Citizens for 10 years. She taught night classes at Kee Business College/National Educational Center in Richmond for 11 years. She is a member of the Virginia Association of Educational Office Professional, an honorary member of the Tri-City Association of Office Professional, a retired member of the Chesterfield Association of Office Professionals and a devoted community volunteer.Ruby stays active by dancing, singing, reading, going on senior bus trips and taking golf lessons. Her enthusiastic hobby is coordinating and directing weddings. Ruby follows her philosophy of life by taking "One Day At A Time", enjoying it from start to finish. Ruby performs regularly with the Cameo Jewels, the traveling entertainment troupe of Ms VA Senior America. 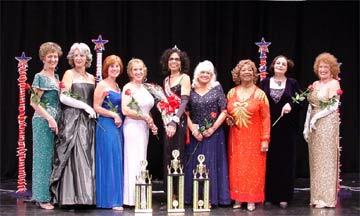 Ruby L. Turner, surrounded by the 2002 contestants and winners including Jeanne Sweeney of Woodbridge, 1st runner-up; Connie Gardner, Richmond, 2nd runner-up; Barbara Guerrieri, Glen Allen, 3rd runner-up; Mildred Crennel, Portsmouth, 4th runner-up. Barbara Guerrieri was the recipient of the 3rd annual community service award for her volunteer services with "The Virginia Voice" a volunteer radio reading service on WCVE-FM. Christine Waleski of Reston, received awards for the most ads sold and for the highest ticket sales. Suzi Athanas of Virginia Beach was voted Ms Congeniality.